It’s monday and the beginning of June. Let’s look at last weeks PvP leaderboards. For those who didnt know: 6 more Weeks until the launch of Albion Online is upon us! For week #1 of June read on below, for a little recap of the month of May 2017 – please check here. Comment: 1.8m is on the low side of possible kill-fame as well, but since it is an open world kill it makes it interesting. Radamanthiz walked into a Tea Party trap it seems, losing a total of 3 GvG sets (8.1). Ouch. Shoutout to Vazik for dieing twice in 8.2 in a GvG against NoLife as well. Comment: New alltime high! Lkuk. Grats! We tried finding cheesy fame farming kills, but we didnt yet. So it looks legit. Kills are from a good streak of HG action it looks like. Finally people are bringing their shinies out to play! The rest of the top#10 are all above 4m which is noteworthy, meaning we see more people dieing in high tier gear. Comment: Red Army still uncontesed at the top spot. Respect for keeping up those impressive numbers week over week over week. Everyone else in the top#10 – especially the lower ranks get into the top#10 with pretty low fame overall. I for one am looking forward to Hector numbers next week! Comment: Nothing stands out this week, except for Red Army still being active compared to almost all other guilds and maybe Tankui Russia which is a new face we haven’t seen much of before. Comment: I wanted to do a guild compare again, but then I realized that the killboard has an issue I didnt take full notice of yet. 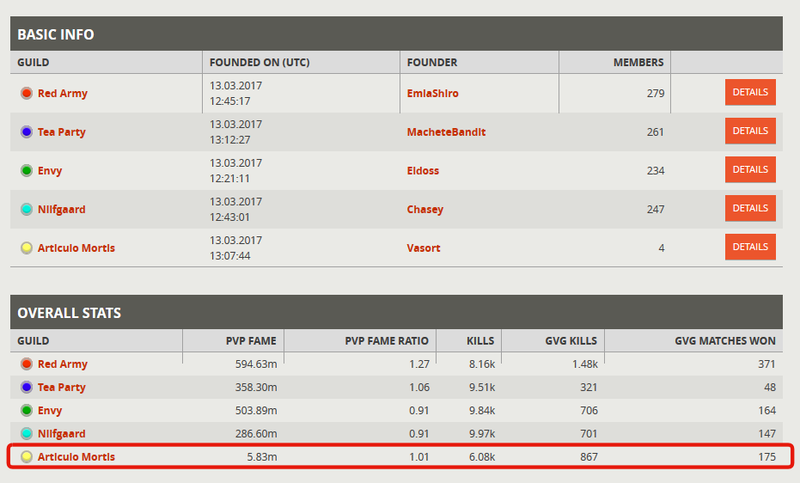 The PVP Fame and PVP Fame Ratio numbers are put on the KB by adding the stats of current active members, which kind of makes an analysis using the guild compare tool somewhat useless.